First off, excuse the large pics overlapping the edges on the right, but I wanted to convey the sweeping feel of the destruction, and needed the larger size for that. Here is Part One and Part Two of this little series. 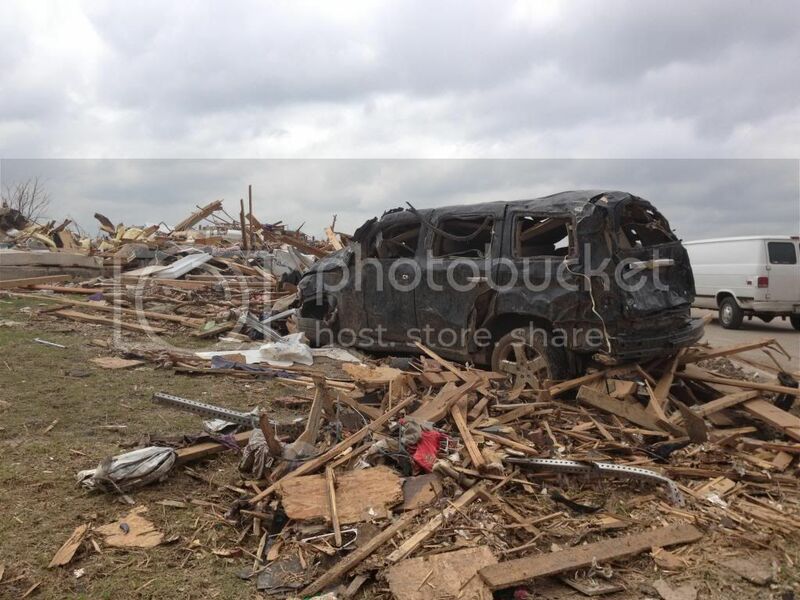 It had been five days since the tornado when my mom, Matt and I headed to Moore with Henderson Hills Baptist Church. We had our leather gloves and heavy boots, but we weren't really sure what to expect. Personally I wondered if we were really needed. The influx of volunteers had been so great, I couldn't imagine that twenty of us would really make any difference. On the drive down in the bus we all chatted. But as we drove through the strip of land that had been decimated on both sides of the freeway, the bus fell silent. Seeing it in person is different. 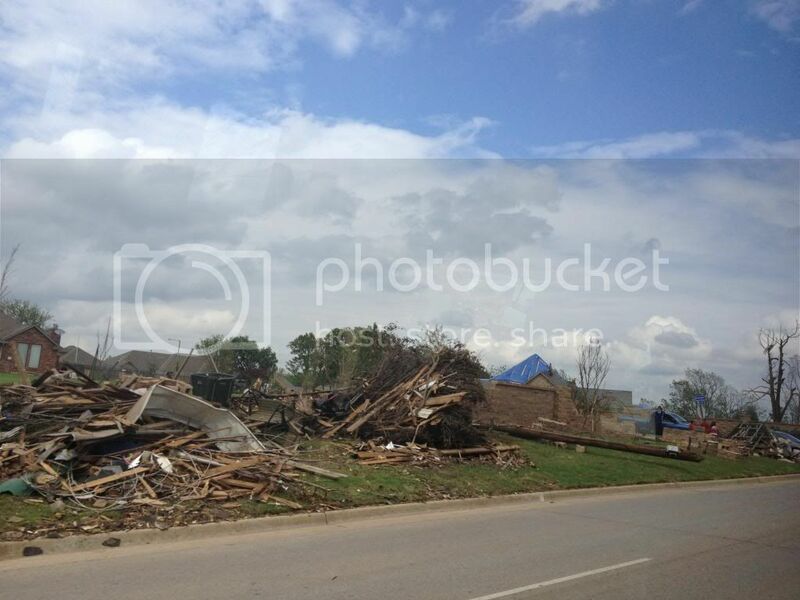 This was taken from what was the living room of a two-story house. 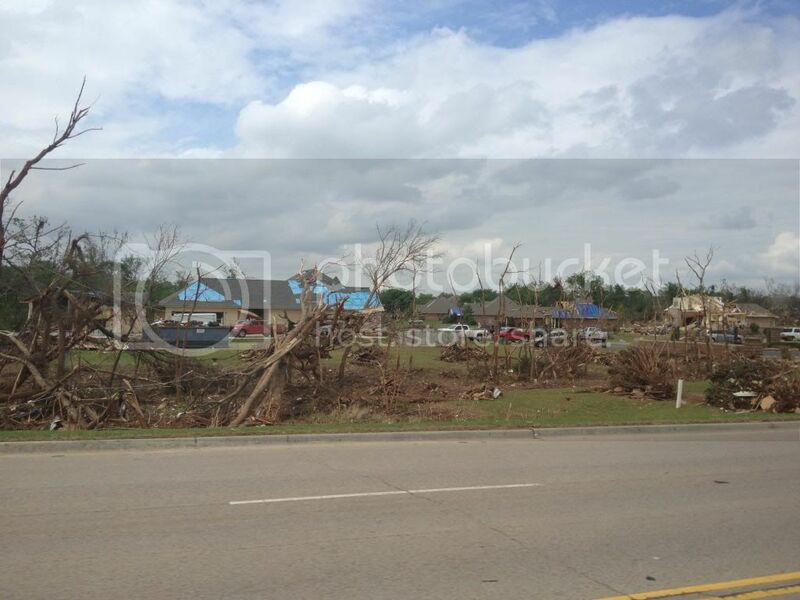 You can see down the stretch where the tornado ran, because nothing is left standing. Near the fringes, varying degrees of destruction showed on tarp-covered roofs and piles of mangled branches ripped from a tree and shoved into yards. We parked at the CVS on SW 19th and Santa Fe where a large volunteer feeding station had been set up. As we ran to use the restroom in CVS before heading into the zone, the pharmacist saw us, ran out and stood to the side, nodding and thanking each one of us as we headed to the bathroom...before we had even done anything! The gratefulness touched my heart. A few of the team members (including Matt) got a free tetanus shot from Walgreens across the street and then we began walking into the zone. We neared a house where a man was clearing out debris and asked if we could help. This house was on the outer edges of the main path. The roof was partially gone and damaged, and the backyard was filled with branches, fiberglass insulation, glass fragments, roofing shingles and wire. Back and forth, from the backyard through the muddy red clay side yard and to the front yard we carried armfuls of debris and dumped them in an ever-growing pile. I pulled a twisted piece of metal thicker than my arm a foot and a half out of the soaked lawn where it had impaled itself. Glass was everywhere. So many tiny fragments. How do you ever pick them all up from the grass? When can bare feet run here again? My arms started to itch, and then my neck and chest. Fiberglass insulation was not just in cotton candy pieces on the ground, but in the air as well. Making its way into your pores, spreading with your sweat and driving you mad with itching. We finished taking down the man's back fence, and as we toppled it over he said, "Well, we were going to replace this fence anyways." Long stretches of wire had wound its way into trees and tied large bulk of debris together. Picking up armfuls of shingles, I found one shoe. A startlingly human reminder in the construction material cleanup we had been doing. Then I found a soaked teddy bear, his head cocked to the side as if to say, "Wha happened?!" Matt went inside to help move out furniture and came back shaking his head. The rain had gotten everywhere inside, and everything was mildewed. When that neighbor's backyard had been cleaned up, we did his two neighbors on either side. Carrying armfuls of debris no bigger than your hand. Sliding in the mud. Tossing it on the growing heap. When those three backyards were pretty well cleaned up, we moved on. As we rounded the corner, we came upon the main path the tornado took. And it took our breath away. One man from our group just turned in circles with his hand over his heart. Everything was just flattened. There were stumps of trees, and larger heaps where the homes had stood, but the overall look of everything was just smashed. Like a giant had decided to practice the polka there. We headed down the street and broke into two groups--one searching through the wreck of one house for photos and a wedding ring, the other to help clear debris to get a truck out. The white Dodge Ram truck only had 8,000 miles on it, and had been parked in the driveway of the house. So much debris had been shoved under it from the force that it was a couple of feet off the cement, and piled on top was the remains of a house. The front windshield was busted in, but amazingly while clearing debris the car alarm went off. When the door was finally clear, the owner got it...and started up the car! This gives a new level of meaning to their slogan "Guts. Glory. Ram." Not only did the car start, but when a path over the debris was cleared, they hooked the back of it up to another truck, and the white Ram drove out. One of the most shocking things to see was a pickup truck on its side, nearly wrapped around a tree trunk. Next we headed to a home that had been two stories. I worked in the area that was the downstairs bathroom as we dug for photos and jewelry. Thankfully we found a lot of photos--wedding pics, baby pics, graduations and birthdays, and some from the 1940's and 50's. When I looked down this was what we were sifting through. It was amazing we found anything at all! Sheetrock was so saturated from the rain that when you tried to lift pieces it just crumbled in your hands. We pulled out unbroken framed pictures, books, cards, silverware, and some of her collection of bells and squirrel figurines. While combing through I heard my mom exclaim, "OH!" I looked over and she said, "I think--I think it's...dead? OK, I can do this," and she reached in and grabbed...a wax squirrel. It was the weirdest, ugliest tchochke I'd ever seen, but it meant something to the owner of the house and we were glad we found it. After awhile working in that house, and lots of cheers for each time we pulled up a soggy photo, we headed out again. The whole time, volunteers were continually driving by, offering water, hamburgers, snacks, baby wipes, and encouragement from the back of pickups or wagons they pulled around. We pitched in at one more house where the chassis of a pickup truck was lodged firmly into the front of the house, and somehow a man who had been inside the house and trapped behind the truck was able to get out with no serious injuries. Talking to a woman a couple of houses down, we found her son's best friend down the street had broken his pelvis and lost his mom. As it was getting later in the day and getting warmer, most people we starting to head home. Here are a couple more snapshots from walking around. Then we headed back, ate a hamburger and boarded the bus for home. Because of the horrendous traffic on the freeway, we took side streets miles from where we had worked, and the damage stretched all the way there, too. When we first headed down I thought, "What's one little team going to do to really help? There are thousands of people volunteering every day?" 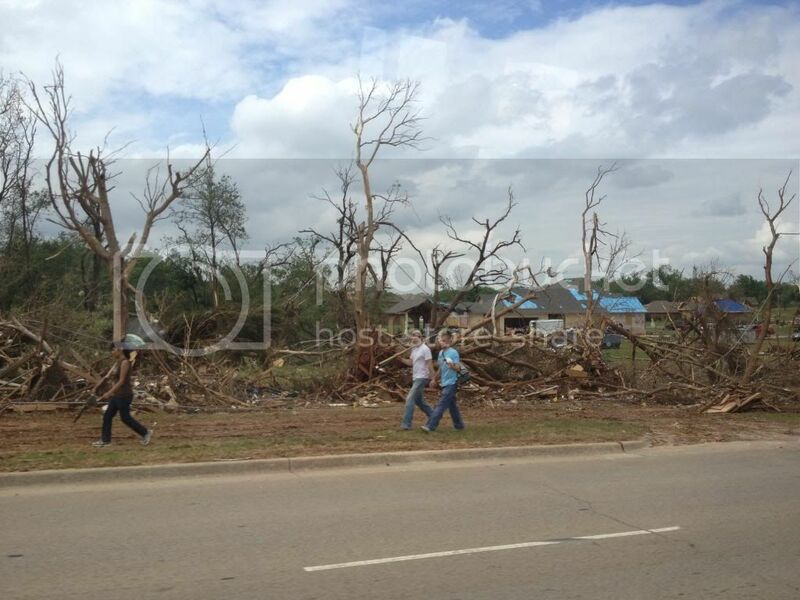 After seeing some of the 1,200 homes destroyed and 12,000 damaged, I see that our team did help. We helped the homeowners get their yard cleaned up a whole lot faster than if they had been by themselves. We helped a lady recover photos that, a day or two more, would have disintegrated in the moisture. We pulled out a toolbox for a man who had worked for GM for years, and when he retired they had it specially made for him. What we did made a difference to those people. And whatever contribution you make--be it monetarily, your time, your energy, food, or prayers--that makes a difference, too. You DID make a difference. Guaranteed. I love you and your family and that there is no other way for you guys to respond than to go help those who are hurting. Blessings to you guys.